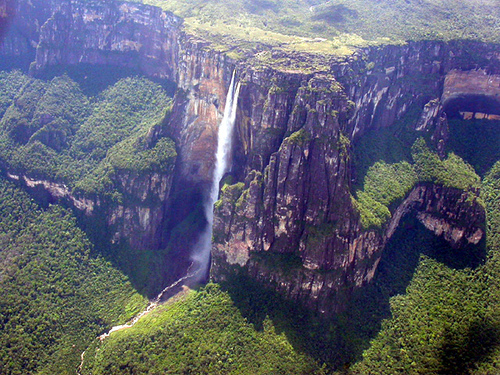 Angel Falls in Venezuela is the worlds highest uninterrupted waterfall. It has a height of 979 m and plunge of 807 m.
The water falls is called Angel Falls from the mid 20th century .It is named after Jimmy Angel , US aviator who was the first person to fly over the falls. The water falls from the top of the Auyantepui mountain. The first European to visit the falls according to some historians was Fernando de Berrio in 17th century. The waterfall is located in an isolated jungle .Angel fall is one of Venezuela's top tourist attractions. Such a beautiful place to visit. Will definitely include this on my bucket list, will not miss the chance to be part of this history. Me and my classmates from http://bethewriteryoudreamofbeing.com/ can't wait to plan our trip in Venezuela.